Great day trip to Mount Nebo and the DEAD SEA. Salty is not the word. After 2 showers I still feel salty. Lol As stated below it is earth's lowest elevation on land at 427 meters (1401 feet below sea level). 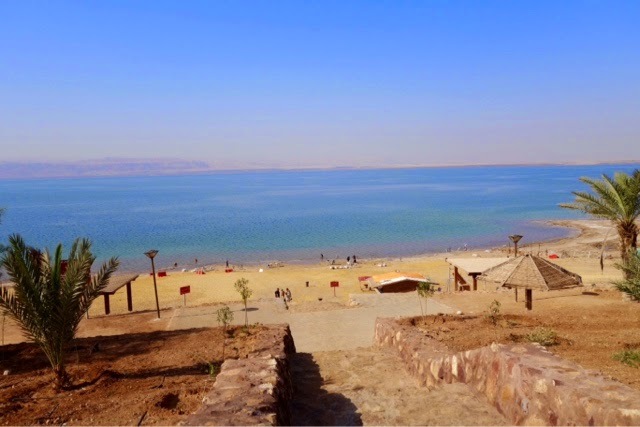 The Dead Sea (Hebrew: יָם הַמֶּלַח, Yām HaMélaḥ, "Sea of Salt", also Hebrew: יָם הַמָּוֶת, Yām HaMā́weṯ, "The Sea of Death"; Arabic: البحر الميت al-Baḥr al-Mayyit ,), also called the Salt Sea, is a salt lake bordering Jordan to the east, and Palestine and Israel to the west. Its surface and shores are 427 metres (1,401 ft) below sea level, Earth's lowest elevationon land. The Dead Sea is 306 m (1,004 ft) deep, the deepest hypersaline lake in the world. 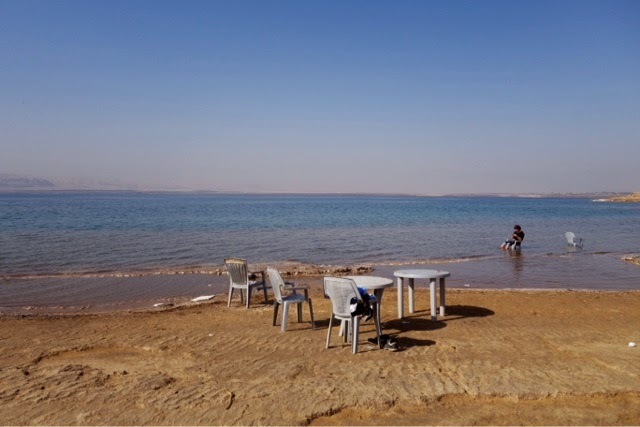 With 34.2% salinity (in 2011), it is also one of the world's saltiest bodies of water, though Lake Vanda in Antarctica (35%), Lake Assal (Djibouti) (34.8%), Lagoon Garabogazköl in the Caspian Sea (up to 35%) and some hypersaline ponds and lakes of the McMurdo Dry Valleys in Antarctica (such as Don Juan Pond (44%)) have reported higher salinities. It is 9.6 times as salty as the ocean. This salinity makes for a harsh environment in which animals cannot flourish, hence its name. 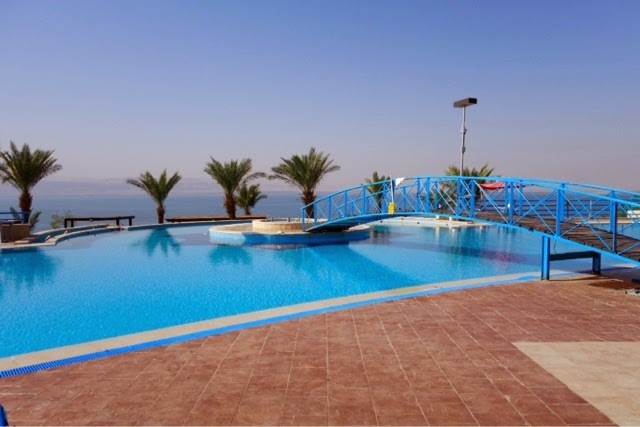 The Dead Sea is 50 kilometres (31 mi) long and 15 kilometres (9 mi) wide at its widest point. It lies in the Jordan Rift Valley, and its main tributary is the Jordan River. 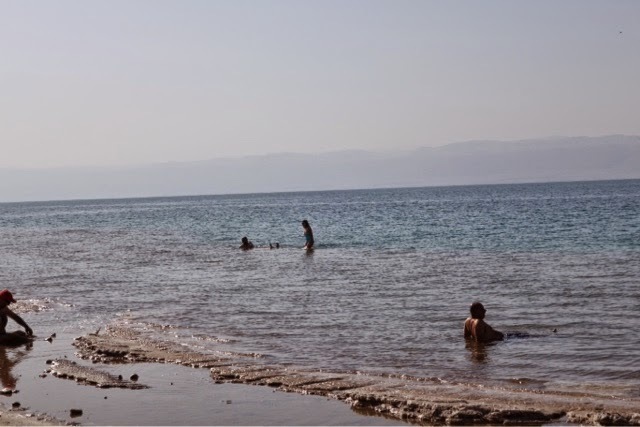 The Dead Sea has attracted visitors from around the Mediterranean basinfor thousands of years. Biblically, it was a place of refuge for King David. 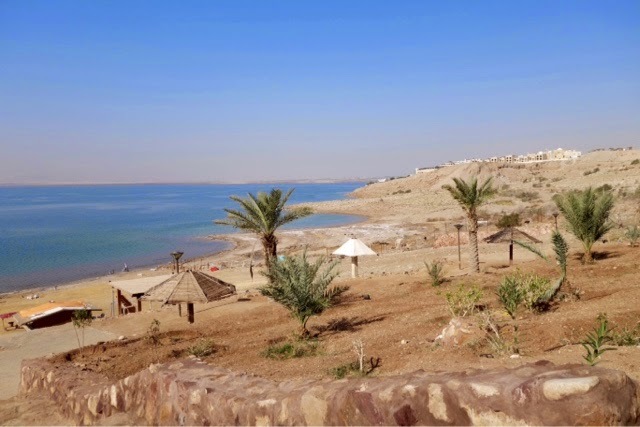 It was one of the world's first health resorts (for Herod the Great), and it has been the supplier of a wide variety of products, from balms for Egyptianmummification to potash for fertilizers. People also use the salt and the minerals from the Dead Sea to create cosmetics and herbal sachets.